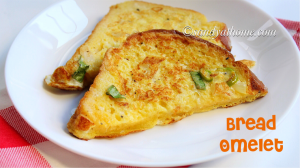 Bread omelet is no new term to anyone as it is one of the rescue recipe and also the easiest recipe that is beginner and bachelor friendly too. 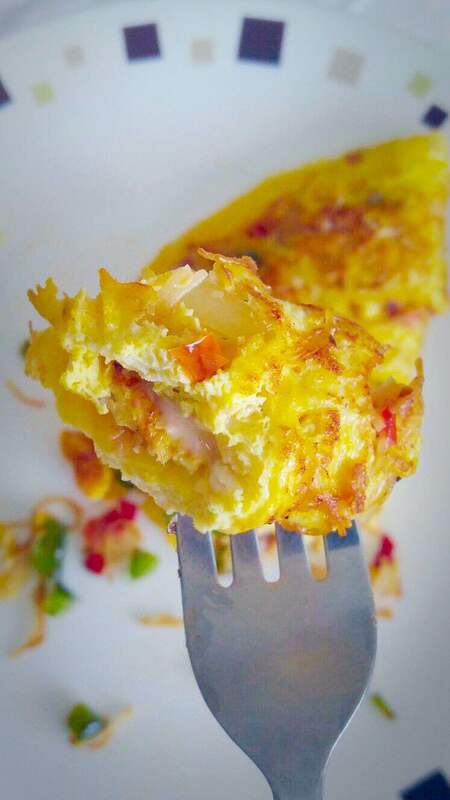 Bread omelet where both bread and omelet both is cooked at the very same or cooked separately and consumed together has many variety of preparations starting from household to street vendor. Any special ingredient you add the work is going to be simple and will not involve any detailed work. 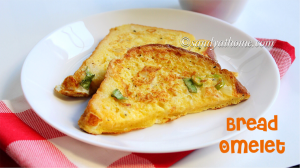 Bread omelet is a quick and hassle free dish for breakfast on a busy morning or for evening snacks which will be relished by both kids and adults. 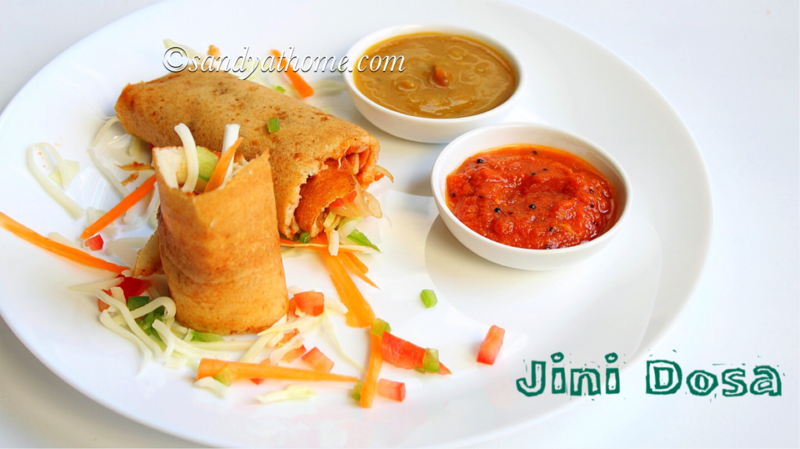 It is healthy and at the same time easy to consume and prepare which is why it is always a hit year after year too. 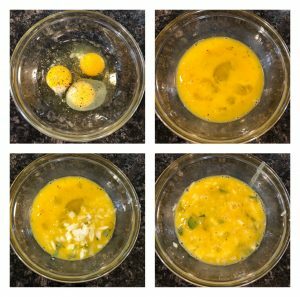 So below is a simple method to prepare delish bread omelet in a way I like it and I am hoping to post much varieties of omelet in coming posts. So lets get to the making! In a wide bowl break 3 eggs, to it add salt and pepper powder. Beat the eggs well. Now add the chopped onion, green chilli and curry leaves. Mix well and keep it aside. Heat a tsp of butter/ oil in a pan/ tawa. Slice each bread into halves. Coat each slice bread well in egg mixture quickly. You need to be really quick as the bread will become soggy. Coat both sides of bread with egg mixture. Now gently slide it onto hot tawa and cook in medium flame. Once the sides brown flip it gently and cook till done. When the bread slices looks perfectly cooked remove it from pan and transfer it to a plate and relish with sauce/ ketchup along with a hot cup of coffee. 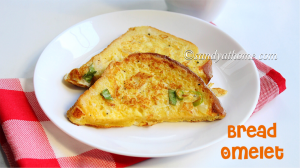 You breakfast for lazy or busy morning is sorted! In a wide bowl break 3 eggs, to it add salt and pepper powder. Beat the eggs. Now add the chopped onion, green chilli and curry leaves. Mix well and keep it aside. Heat a tsp of butter/ oil in a pan/ tawa. Slice each bread into halves. 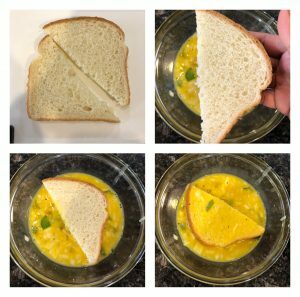 Coat each slice bread well in egg mixture quickly. You need to be really quick as the bread will become soggy. Coat both sides of bread with egg mixture. Now gently slide it onto hot tawa and cook in medium flame. Once the sides brown flip it gently and cook till done. When the bread slices looks perfectly cooked remove it from pan and transfer it to a plate and relish with sauce/ ketchup along with a hot cup of coffee. 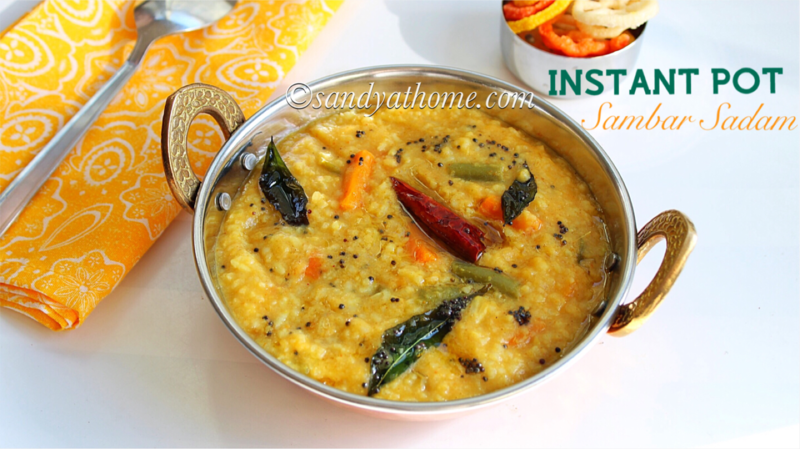 You breakfast for lazy or busy morning is sorted!